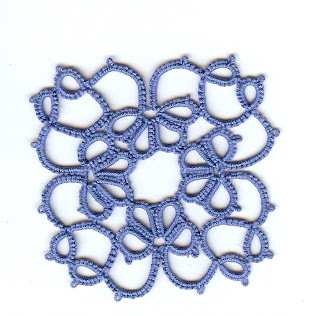 I have been working on my motif's for the 25 Motif Challenge and here is number 2. 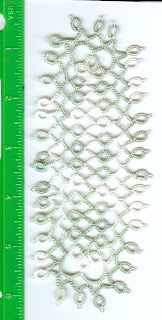 It is the patchwork pattern from Mary Konior Tatting with Visual Patterns. Of course this was my second attempt. I like the pattern but had to pay close attention to what I was doing. I didn't want to have to "PICK" out any rings again. This one is made with size 10 Cebelia thread and I have enough thread to make a whole bunch more. reads this blog so she isn't getting any updates on the bootie progress. It has warmed up in Alaska, in fact it is warmer there than it is here. She said it was about 20 above today. She had to go to Fairbanks to pick up her husband. He works on the North Slope for the pipeline and is gone anywhere from four to six weeks at a time. Her puppy went missing yesterday afternoon. She let all three dogs out as they had been house bound for the most part the a couple of weeks do to the cold. The little one didn't make it home. They found it on the railroad tracks this morning. It appears is survived the night but was hit by a train. They are going to build a big bonfire to thaw out the ground so they can bury the poor thing. On to other news, my father almost had a house fire yesterday. The furnace caught on fire and he has a scorched spot on the floor where the fire was under the boiler. He refuses to stay away from home, unless he goes to the casino. So he set up some space heaters to keep the house from freezing and stayed home. It may be a couple of days before he get the new furnace installed. What excitement in my life these days! My granddaughter loved her necklace. I heard her say to her mother "It's an awesome necklace". So I think that said it wall. I was happy with the way it turned out. I may need to make her some more. Valentine Day is coming so maybe I can get one made out of read and white and have a heart on it for her. My goodness with all the unfortunate news around you your tatting is beautiful! Sorry about the puppy and the housefire! I hope the rest of the new year plays out better for all! Ok I think you have had enough err excitement to last you the whole year :| I too am sorry to hear about the puppy. I am however glad to hear your father is OK and things weren't any worse. We have some friends who just a week or so ago lost everything, their house, belonging and some baby goats that were on their porch. At least they are safe. Fires can be so scary. On a happier note,,,Your motif is really pretty! Can't wait to see the booties when you are finished!